Lovin The Life I Color: 2015 Hero Arts Hosti Catalog Blog Hop!! 2015 Hero Arts Hosti Catalog Blog Hop!! Welcome to the Hero Arts Hostess Hop, featuring fabulous stamps from the new 2015 release! If you’ve been following along, you’ve just arrived from my Friend Deborah Nolan's Blog! 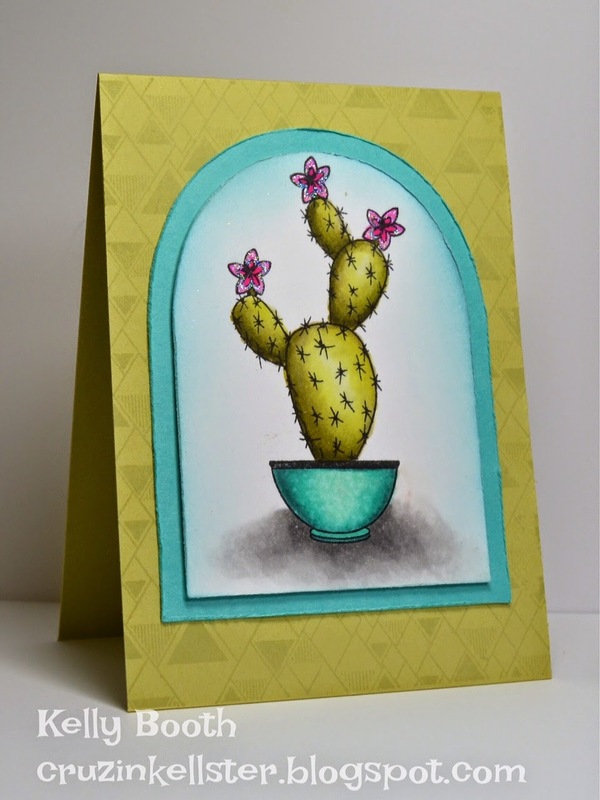 My first card I created using the New Triangle Background and the CL838 Stamp your Own Cactus clear set. I Love the cactus set...so perfect for Arizona and the CG662 Triangle Background is so versatile. Here is another card I created using the Triangle Background and the Hero Arts Large Butterfly Die. I Love using the Hero Art Layering Papers and turning them inside out for a Pop of color on the inside. I also was given the New wood block F6074 You're my cup of coffee so I combined it with the older clear set CL731 Need Caffeine and made a simple card. Your next stop on the Hero Arts Hostess Blog Hop is Jenn Biederman ! Be sure to leave comments a long the way for a chance to win some Fun prizes!! Hero Arts will randomly choose three people from the comments thought the week to receive a Hero Arts Prize Pack!! Your cards are all stunning Kelly, love your fun cactus cards especially!! Great fun hopping with you again this year. Oh My Goodness! I love the coffee card! I LOVE the howdy cactus card! The triangle background is so pretty and I love your butterfly card!!! Love the cacti! They are colored so beautifully! The triangle background is so versatile! Thanks for sharing! I think those adorable cactus are a "must have!" your coloring and shading is masterful! Oh I love that triangle background! It's lovely used tone on tone the way you did under the cactus. Great cards! 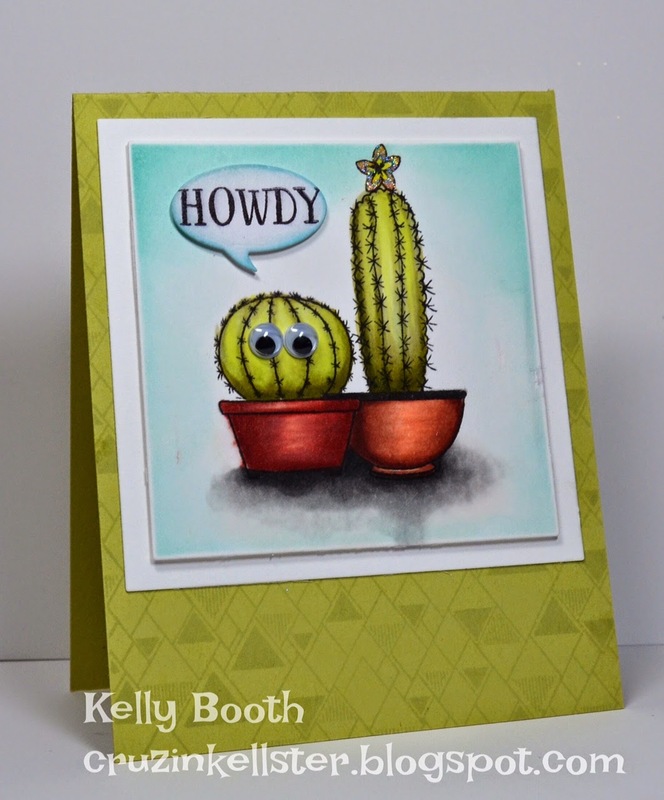 Kelly, I am loving these cactus cards and paired with the bg stamp, a perfect pairing! The howdy cactus card is adorable. Since I love coffee I will HAVE to get the coffee stamp! Oh, I love those cards! Great colors, coloring and design! Striking colours, the cactus cards are so cute! The triangle BG is really vibrant!! Wow!! Love all your cards Kelly! The cactus cards are adorable! Thanks for the multiple ideas so well done! Cacti were beautiful and inspired by the use of all the coffee stamps! Wonderful cards. I like your use of the triangle background and the fun googly eyes on the cactus. Your cacti are adorable and the butterfly card is so pretty! Love the stamps! Your coloring on the cactus is perfect! Love that card! Love the coffee card!! I want those stamps!!! Beautifully done, Kelly, as always - you've really brought these fun stamps to life! Googly eyes on the cactus - sooo cute! As I sit drinking my coffee your coffee card spoke to me. The colorful butterfly is so pretty and I love your coffee-themed card! Those cacti are sooo cute! I lived in Arizona many moons ago and this stamp set really captured my heart. So much wonderfulness here, Kelly! :-) Especially love the eyeballs on your cactus, hee hee! Silly little cactus, you make me smile! Wow your coloring and background inking is simply gorgeous, love your card designs!!! Such fun cards - love the cactus with the wiggly eyes. Beautiful cards! Love those cute cactus stamps! Ha-Ha I love that the cactus has eyes!! I love the silly cactus. I love the cactus when they aren't silly too. I would love to see a video on your background for the butterfly card. wonderful cards Kelly. Love the cute little one with the eyes! magnificent!! Your coloring on the cacti cards makes those stamps sing!! And the butterfly ... be still my heart. Love hopping with you ... well, love you!!! Biggest hugs to you dear friend. I like the background stamp with the tone in tone stamping... But I also like it colored in and bright. Very versatile! Such fun work Kelly from a googly-eyed cactus to a terrific coffee break--Wonderful inspiration! Your coloring is spectacular - thanks for sharing these great cards! Awesome cards Kelly. Fabulously fun and colorful. Lovely and fun cards. The cactus set is one of my favorites. Thanks for the inspiration. LOL ... love the googly eyed cactus! This is a great and wonderful release from Hero. I love your cards too. That cactus with the eyes is just adorable! Love love love the cacti! They are so cute and remind me of when I lived in AZ! Love,love,The Howdy Cactus.It's a different set and I love different.Great cards,loving the versatility backgrounds too. Super cards! Love the cacti! I am from AZ and live in MD now. We got a pretty good dusting of snow last night, this card makes me wish I was back in the west for sure. Gorgeous cards - I love the cacti! As always, your cards are really amazing, Kelly! So happy you were part of the hop today! Your coffee card is my favorite!! My friend Lisa would love this - so I just may have to use your idea... thanks again! Wow, you have been busy making so many beautiful cards. I just LOVE them all. Oh, those cactus cards are fantastic. That set is on my list. Thanks for sharing. Cute cards--love adding silly googly eyes to my cards! You got me at "Howdy" Cute cards! I love your cards Kelly, they're all so different! Can't wait to get my hands on the cactus and succulent sets. Kelly, you have such talent! Your coloring on those cactus cards is amazing! I'm swooning over that butterfly card too - wow! And the coffee one is so much fun! Awesome work, my friend! Lovely cards. I like the cactus stamps. Wow! That Triangle background is so versatile. I love it. I love the googly eyes too! I dont usually but I love that one! I like all of your cards. Gorgeous cards, Kelly! Of course I would expect no less; your work always impresses me! Beautiful card! Love how you differently youve used the triangle background in the first two! Your silly cactus card is great, makes me smile. The triangle background has lots of potential. Kelly, love your coloring on your cactus cards! Love the googly eyes on the first cactus!!! Super silly & adorable! Fun and fabulous cards, my favorite is the colorful butterfly one--love it! Wow, you went all out. Have to say a cactus with googly eyes wins my heart every time. Great cards! I really love that little cactus with the eyes! He looks so worried! Great line up!! I also love the cacti most, but I think the coffee card is also stunning!! I especially love the coffee card, great fun! I adore all of them, Kelly! The googly eyes are too cute and the olive green that you use for the cactus card is spot on! And the last card is simply drop dread gorgeous with that Triangle Background! You rock the hop, Kelly! I love the cacti and especially the little cactus with googly eyes. Your shading is beautiful. These are all really cute. The fun cactus staring back at me really caught my eye and the beautiful colors in the birthday card were an eye catcher, too! Lovely! Beautiful use of the triangle background stamp -- all your cards are lovely, but that's my favorite. you colored those cacti beautifully. What great cards. Wonderful cards! I am a java junkie and love the coffee card! Love the tone-on-tone look with the triangular background stamp. I am blown away by your coloring skills!!! What a fun cactus card - who would have thought to give a cactus some googly eyes? Kelly, Kelly! I would love to have coffee with you sometime! Great cards...and googly eyes just make anything fun! Thank you for sharing! Oooooh! I particularly love that thrid card. Great blend of colors! Wow such fun cards! loving the cactus and coffee ones! I love how you added the google eyes on the cactus and the speech bubble. So fun. Really like your cards. The eyes you added on the cactus are so cute! Wonderful cards! I really love that Triangle background & the different ways you used it. The Howdy cactus card is adorable! Love the cactus card and your coloring is fantastic! Cute cards. Love the eyes on the cactus. OMG your Catus cards are so cute OMG LOL too....and your coffee card is amazing...your Butterfly card is so beautiful you really did a fabulous stamping job and your coloring is impeccable. You really are a very talented gal. YOU so ROCK!! The coloring and shading on your card is phenomenal!! Love the cactus and coffee cards!! I'm a caffeine junkie! The googly eyes on the cactus is so cute. Wonderful coloring. Such fun cards! I really love the eyes on the cactus on the "Howdy" card! Oh Kelly, your cards are amazing! That Cactus card is super adorable, The triangle and butterfly is fabulous with that colorful background and your coffee card is my favorite !!! 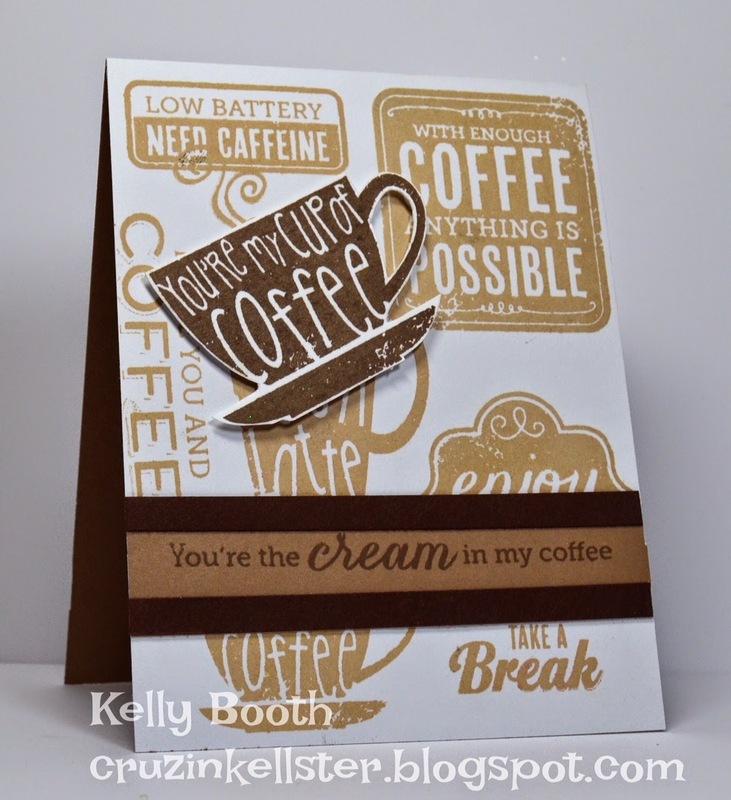 You do a SUPER job of coloring and I really love the coffee card! Howdy from Central TX. Like the cactus cards. Like how you colored the cactus. Especially like the way you added shadow. I love the crazy eyes in your first card! Thanks for the opportunity to win some great products. I absolutely love the butterfly card. Gorgeous! I love the cacti! They look so lifelike! I think cacti and succulants are under-rated. Your cards are whimsical and the background devine. Hi Kelly, I am glad to see someone else use google eyes - I use them with all my critter stamps!! Great cards--I especially like the cactus cards since I'm in Arizona! The eyes on the Howdy card are just too cute! Lovely cards and your coloring is fantastic! I really like these new stamp sets. Great cards - I especially like the google eyed cactus. Lovely cards! The triangle background stamp is absolutely stunning! Your coloring and cleverness never fail to amaze me - love these, Kelly! Amazing colouring on your cactus cards and I love the pretty butterfly card. Oh my goodness, from cactus, to birthday and then coffee. They are all wonderful. Really like the coffee card. Thanks. Your coloring of the cactus and pots is awesome. they look lifelike!! Love this NEW Set...and am excited to see that you used it today! I have already placed my first order and this set with the dies, were one of the first things I bought! YAY Hero ARTS a New Release I truly LOVE!! (At last)!!!! Great selection of cards. I especially like your cactus cards and your awesome colouring on these. Also love that background stamp. AWK! That cactus with googly eyes just tickles me to death! Such cute cards and beautiful coloring! I love the cute cactus with the googlie eyes! And the colorful butterfly birthday card is stunning. Thanks for sharing. Great cards. Don't you just love the coffee stamps. Thanks. A hilarious "howdy" to you! My buddies just moved to Arizona and this set will be perfect for all the new cards I send them. Great ideas. The background is so subtle--very effective. What great cards. Love the cute cactus. I love those cards! Great colors, coloring and design! Love the triangle background, and the butterfly die is the bomb! The cactus stamps look like they are fun to color. I love the googley eyes. The butterfly card is so colorful and pretty, I want Spring NOW! Every single card is stunning, Kelly! Fun to hop along with you! Love the colouring on your cactus cards. They are all fantastic, thanks for the inspiration! Hi Kelly - can't say enough how much I adore these cards! Your cactus shading is a work of art and the other 2 are delightful too!! Thanks for the inspiration - so fun hopping with you this week! Such a cute cactus with the Google eyes! Dang, girl! No one colors like you! You are THAT AWESOME! You made the succulents set shine and love the intricate background of your 2nd card! Beautiful work. Glad to be re-united with my sisters! I love, love the cactus cards...in fact, I just ordered the set. Love how you put the googly eyes on. Great set! Love the cactus cards. The google eyes are too cute! Wonderful cards. Love the triangle background! Such amazing new stamps, and your cards are FAB! Thanks for sharing! Super spring release, your cards are Fabulous! love the googly eyed cactus! Great cards, they are all colored so beautifully:) My fav Is the butterfly card! It's stunning! Oh my gosh!! I adore the googly eyes you put on the cactus!! I also love the backgrounds you created with the triangle stamp. Especially the butterfly birthday one! Love the cactus with the google eyes! Coffee and cactus! Two of my favorite things. Thanks for the ideas. I love your cards. They really show how you can make fun with them. I wasn't to sure about the cactus stamp but now I have to have it. great coloring on those fun stamps!!! Love those cactus cards! And that background stamp is super cute and versatile. And that butterfly card is gorgeous!!! your cards are so cute. I especially love the succulents and am so excited HA has come out with a set. Nice cards, and those googly eyes on the cactus are the cutest! What a stunner!! The triangle background is totally awesome!! I love the cactus set,,, what a great cards Kelly !!! Awesome cards! Love these new stamps! The cactus is so cute! Amazing cards... love the cactus cards, they are so cute!!! Such great cards - love the googly eyes on the first card. Thanks for sharing. Absolutely love the cacti stamps! So cute with the little flowers sprouting. Come on spring in the east. Pretty cards! I really love the bright colors and butterfly on the birthday card. Thanks for sharing. Those cactus cards just made me smile. So cute! The triangle background is definitely on my wish list! Love the 2nd cactus card - the colors are so bright! 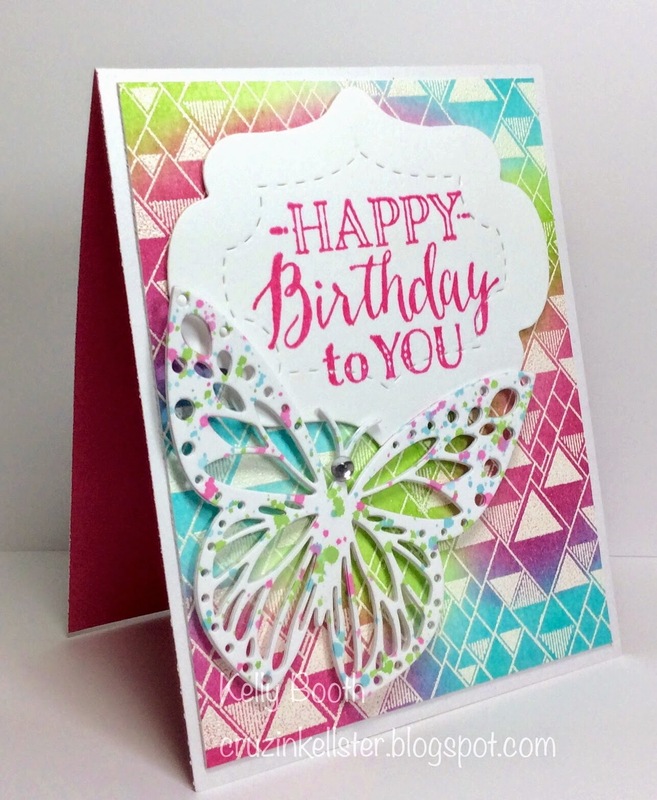 Love the triangle background, and the bright festive colors on your birthday butterfly card! Love these cactus stamps! My dad lives in Tucson so these would be perfect! Loving the cacti!! Fun cards! Great cards...I love the whimsy of the googley eyes on the cactus!! I love how the "Triangle Background" stamp can be dressed down to blend into the scene, or it can truly be the star of the show. Nice work. Love the cards and this background stamp is so versatile and at the top of my wish list! Great job on your cards! I especially like the triangle-watercolor background on one of them. Also love the new coffee stamp. Really cute cards. I especially love the background stamps that are being used and I love the eyes on the cactus! Very cute cards! I especially love the triangle background. Your cactus cards are adorable and the coffee one superb. Love your coloring. Cute cards Kelly! That triangle background looks great with the cactus. I like the butterfly card, so colorful! Wow! I absolutely love the butterfly geometric Happy Birthday card. Colors are like delicious candy confetti. The colors you used for the coffee card are perfect. Thanks for sharing. Love those cacti cards- perfect for us Arizonans! :) and who can go wrong with a coffee card? LOVE! Love that triangle background stamp (and your cards)! Great cards. I really like those cactus cards. Might need that set!